Visitors are being invited to recreate a long-lost manuscript of Emily Brontë's 1847 classic Wuthering Heights to celebrate 200 years since her birth. The original manuscript no longer survives and its disappearance has been shrouded in mystery. The Brontë Parsonage Museum in Haworth, West Yorkshire, is inviting visitors to copy out a sentence of the novel to create a handwritten book. Museum organisers hope it will be ready in time to be displayed next year. The museum has commissioned artist Clare Twomey to create thousands of pencils for the project. 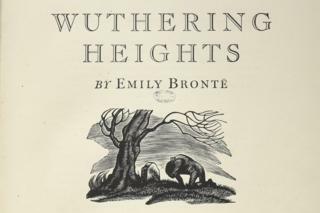 Jenna Holmes, arts officer at the Brontë Parsonage Museum, said: "The lost manuscript of Wuthering Heights is one of the great Brontë mysteries. "It's a simple but very powerful work, which we think will strike a chord with visitors to the museum this year." Ann Dinsdale, the museum's principal curator, kick started the project with the artist by writing the opening sentence from the novel. Emily Brontë was born on 30 July 1818. She and her sisters Charlotte and Anne lived with their brother and father at the Parsonage during the first half of the 19th Century and their home was turned into a museum in 1928 housing a large collection of artefacts and documents associated with the Brontë family and their work. The sisters wrote a number of English literature classics, including Wuthering Heights, The Tenant of Wildfell Hall and Agnes Grey.